Good evening everyone! It is finally Friday!!! Woo hoo!!! I am so ready for a relaxing Saturday in my office and an Easter Sunday with the family! Do you have any big plans for Easter weekend? 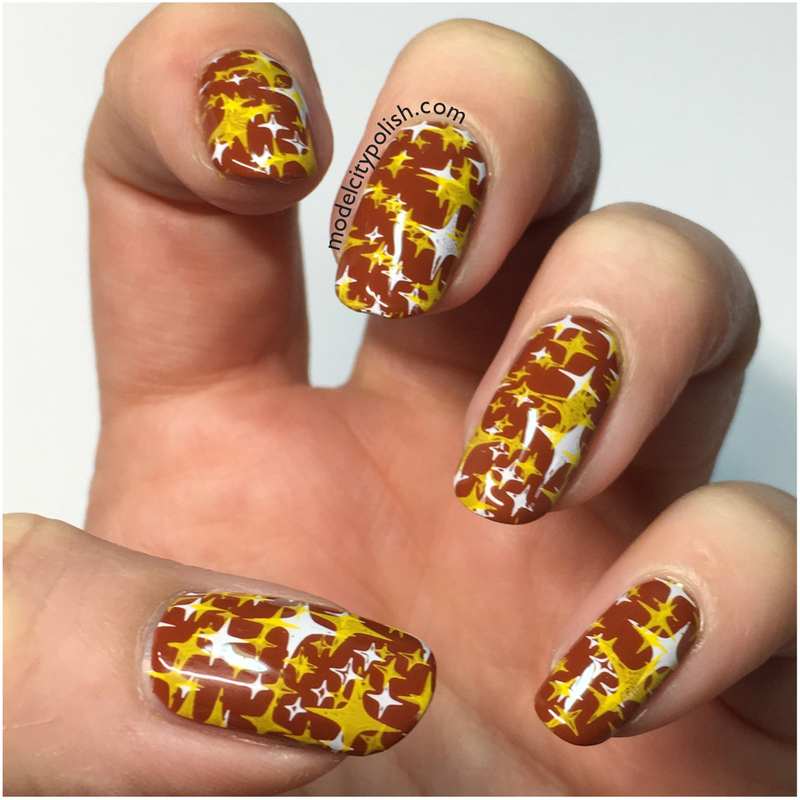 Tonight I would like to share a recent mani I did inspired by a Cassie skirt by LuLaRoe that I received from the Lisa Meyer LuLaRoe VIP Group. 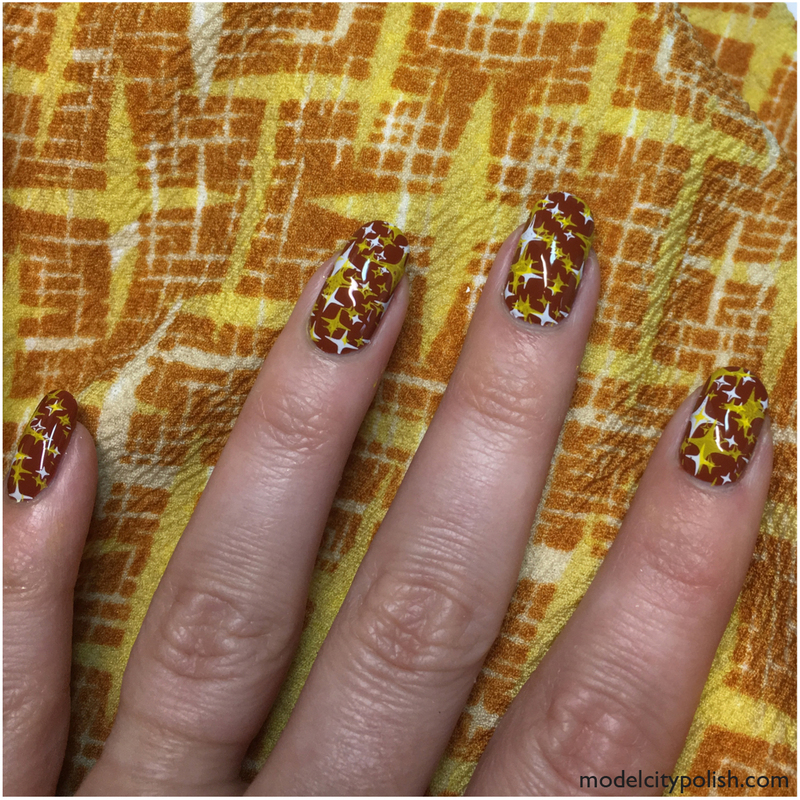 My Cassie skirt had a very vintage, starburst feel and I wanted to take that cool pattern and repeat it on my nails. 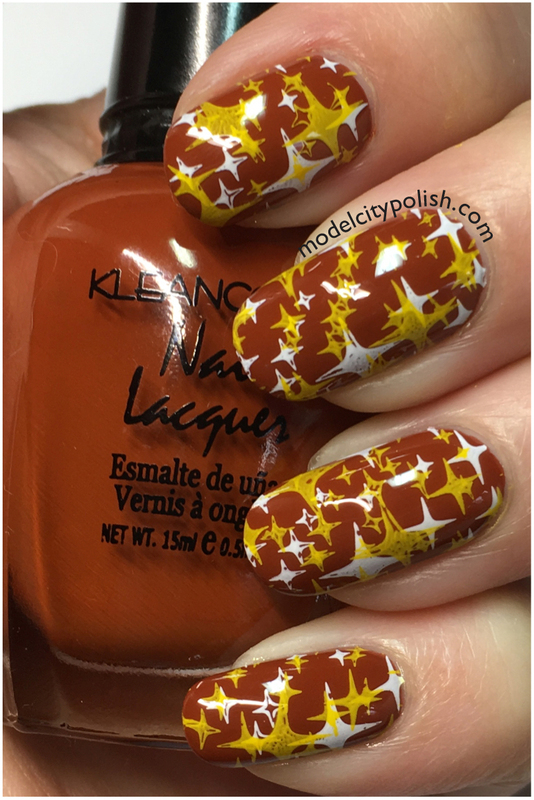 For my pattern matching mani I started off with Kleancolor Brown creme polish. 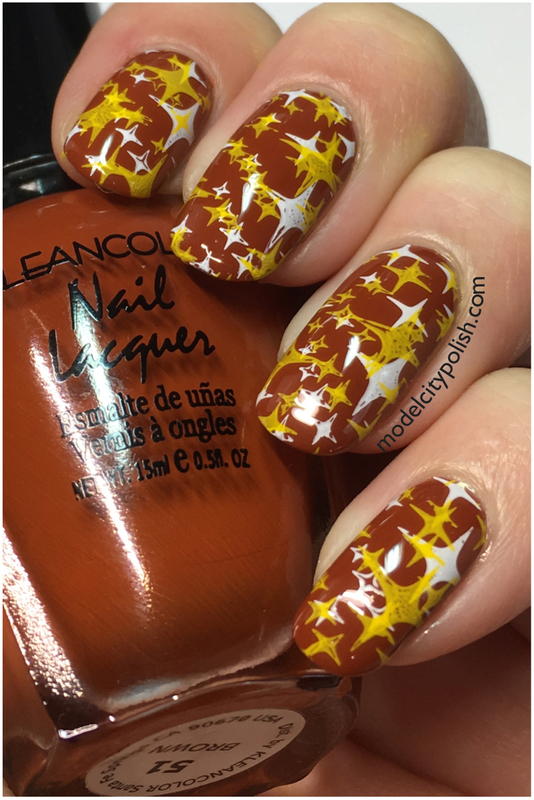 I then used Moon Nails Supply white and yellow stamping polish, and the Fireworks plate from Pet’la Plates to create a layered starburst pattern. Everything was sealed with a coat of SuperChic Lacquer Liquid Macro Top Coat. So what do you guys think of my attempted pattern matching? I like it. I wish the brown had been a little more orange but overall, it was a great accessory to a cute skirt! Now if you want to try a little pattern matching with LuLaRoe, be sure to enter the awesome giveaway going on right now via Rafflecopter sponsored by Lisa Meyer LuLaRoe VIP Group. Thank you so much for stopping by tonight and I will see you all again tomorrow. 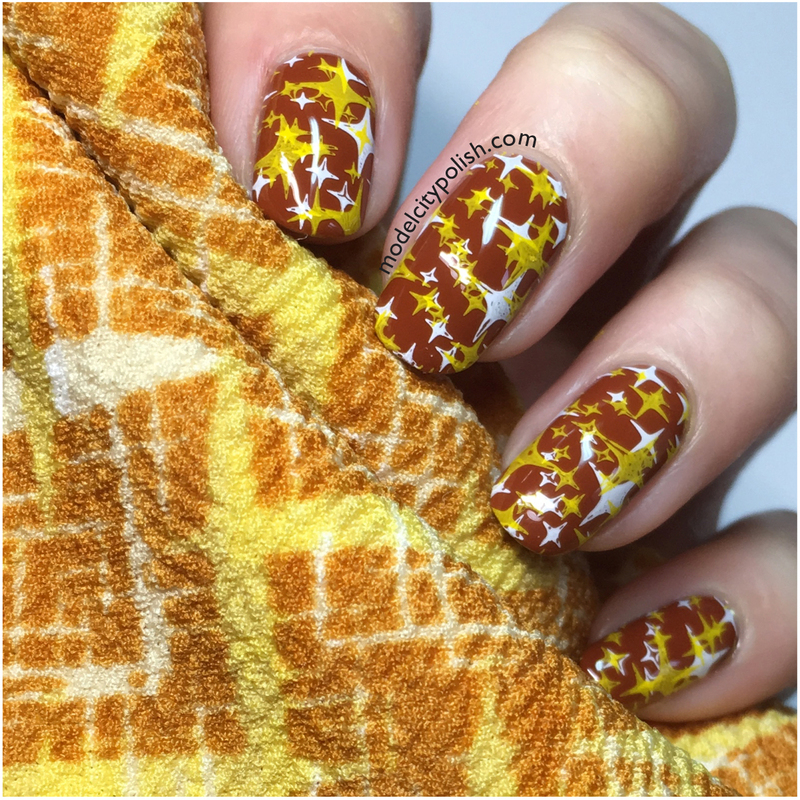 Your manicure is perfect for the fabric. I’m amazed at your skill. I love the complimentary mani for the skirt! That skirt is killer! 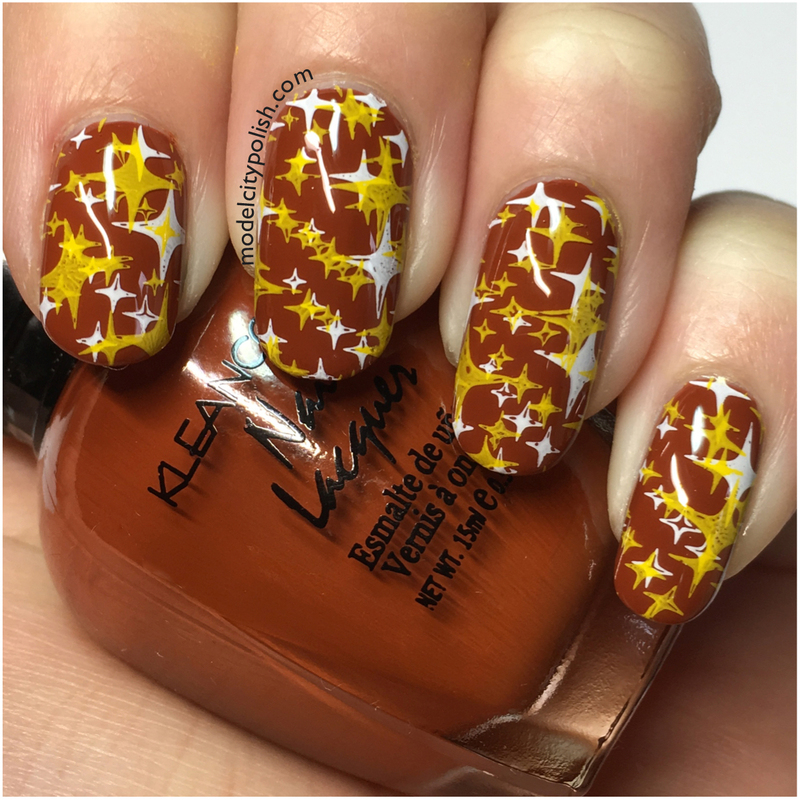 This manicure is so groovy. It throws fantastic 70’s Stardust in Vegas vibes. Your nails are so cute and they match the skirt really well! I have heard so much hype about LuLaRoe lately! I think the pattern is great! And I love the color palette, so retro. Love this! I can see the retro inspiration! oh LLR, I just cant seem to get away. Love inspo posts like this!